On my list of “all things pumpkin”, the next recipe I wanted to try was one that incorporated pumpkin with pasta. 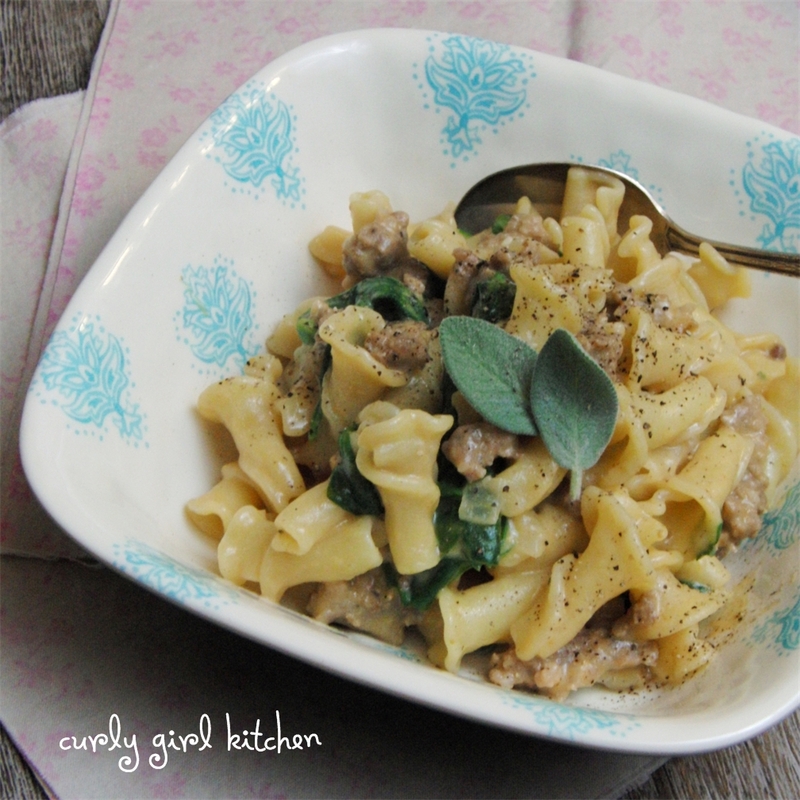 I envisioned a savory pumpkin sauce, rich with sweet Italian sausage, fresh herbs like sage and thyme, and a little garlic and onion, smothering a bowl of al dente pasta with its creamy pumpkin-ness. 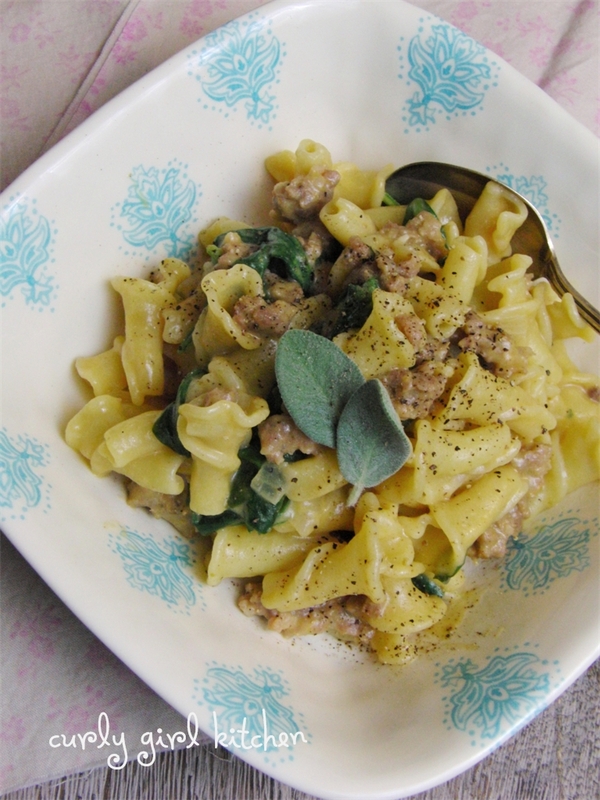 We already had the herbs on hand, the pumpkin, and a half-box of pasta to be used, so all we needed was the sausage – of course, this could easily be made with any type of ground meat that you prefer, if sausage isn’t your thing. We don’t eat it often, though, so once in a while, the richness of the meat tastes pretty good. It happened to be Jamie’s week for dinner and groceries, but I went ahead and made the grocery list and dinner menu for him since he was busy with his car, and when he saw my scribbled notes for “pumpkin pasta”, he looked at me like what the heck is this? So, since I couldn’t expect him to read my mind and see the vision I had for what I hoped would be an amazing dinner, I helped him out. He had his doubts, even while we were making dinner, that a skillet of sausage, onion, garlic and herbs could find a happy marriage with pumpkin and milk, but in the end, he was pleasantly surprised by the result. The pasta was creamy, rich, and completely harmonious. In a large skillet, heat the oil over medium heat. Add the onion, with a pinch of salt, and cook for 5 minutes. Add the garlic, sausage and herbs. Cook, stirring with a wooden spoon to break up the meat, until the sausage is browned. Drain off as much fat as you can and discard. Sprinkle the flour over the meat and stir to combine. In a bowl, whisk together the pumpkin, milk and half ‘n’ half. Pour into the skillet and combine with the sausage; bring to a boil over medium heat, then reduce to medium low to simmer for about 10 minutes, until thickened, stirring occasionally. Taste and season with salt and pepper as needed. While the sauce is simmering, cook the pasta according to the instructions on the package. Drain, then return the pasta to the pot. Add the spinach and the pumpkin/sausage sauce, and stir until all the pasta is coated in the sauce and the spinach is wilted. 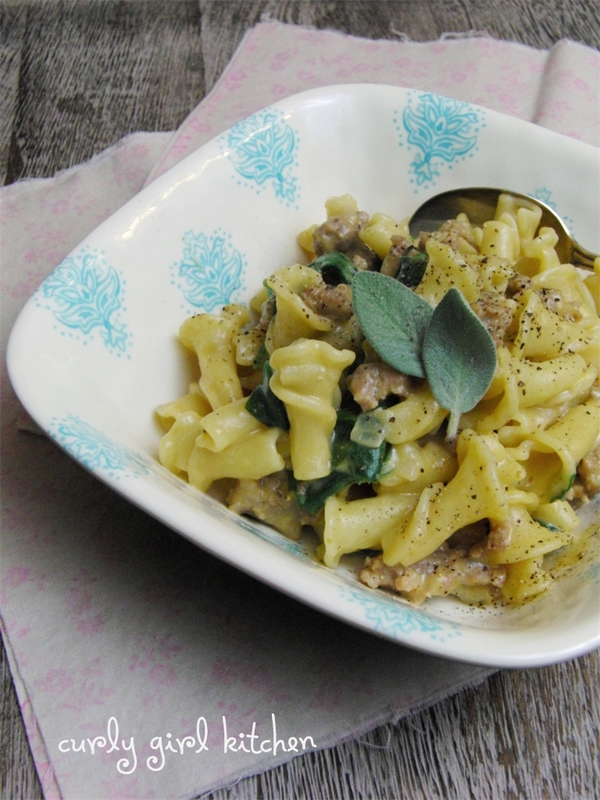 Garnish each serving with a fresh sage leaf.